The bride and groom will love this very special wedding keepsake. It will be the gift they will cherish and display always. 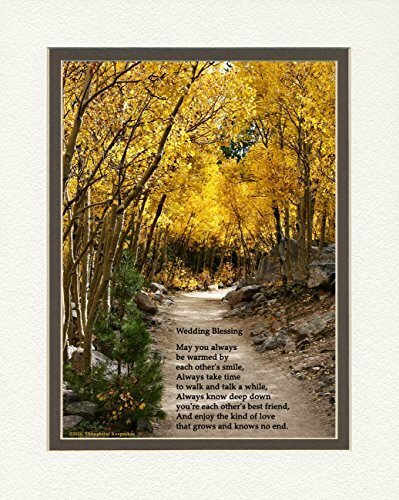 This beautiful photo of a lovely serene path surrounded by aspen trees includes the poem: Wedding Blessing (above poem) May you always be warmed by each other's smile, always take time to walk and talk a while, always know deep down you're each other's best friend, and enjoy the kind of love that grows and knows no end. This gift celebrates not only the special occasion but more important the unique individuals. If you have any questions about this product by Anniversary & Wedding Gifts, contact us by completing and submitting the form below. If you are looking for a specif part number, please include it with your message. Bathroom Decor Set of 4 Unframed 5x7" Prints - Rustic Bathroom Wall Art in Aqua Black and Teal. Vintage Baseball in Catchers mit on Vintage Background, Baseball Wall art, Sports Decor, Vintage Baseball Art, Baseball Photography Available as print or canvas.